Dr. (Fr.) 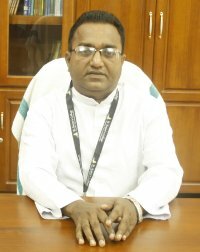 V. Y. Dasappan S. J. We are pleased to have you here at St. Xavier’s, a Jesuit institution of higher learning. At St. Xavier’s we look at education differently. In our socio-cultural scenario there is a paradigm shift in the approach to education. For long, education has been considered a sacred vocation or a mission of commitment. But today the entire focus is to meet the demand of labour in the market, without giving due attention to the character and spiritual formation of the individuals. As understood rightly, teaching is not just transmitting knowledge but, more importantly, forming and transforming young people. It is in this context that Jesuit education assumes significance. As a Jesuit institution we recognize the developmental stages of intellectual, affective and spiritual growth and assist each student to mature gradually in all these areas. Thus, the curriculum is centered on the person rather than on the material to be covered. Due importance to Personal development through the training of character and will, overcoming selfishness and lack of concern for others and the other effects of sinfulness, and developing the freedom that respects others and accepts responsibility, is all aided by the necessary and fair regulations of the college; these include a fair system of discipline. St. Xavier's, all along its journey, has striven towards excellence and equity with the collaboration of all the concerned, namely faculty, non- teaching staff, parents, students and well- wishers. I would like to have your wholehearted and continued support in realizing our common dreams.